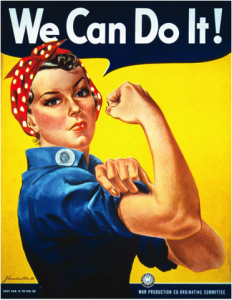 Celebrate U.S. Women's History Month! This holiday honors the accomplishments of women, throughout history and in modern-day society. The celebration of women's achievements first started with International Women's Day, which is on March 8th. Women from regions such as Germany, Austria, Denmark, and the United States fought for rights to vote, hold public office and equal treatment in the workplace by leading strikes and protests in their cities. The first celebration of Women's History Week in the United States took place in 1978 at Sarah Lawrence College, a widely known women's liberal arts college. It is also the first college in the nation to instate the first graduate degree program in Women's History, which was founded by Dr. Gerda Lerner in 1972. In 1980, U.S. President Jimmy Carter proclaimed the week of March 8, 1980 as National Women's History Week. In his proclamation, he stressed the equal contributions of both women and men to the founding of the nation and noted that the contributions of women such as Sacagawea, Susan B. Anthony, Eleanor Roosevelt are often overlooked. One year later, Senator Orrin Hatch (a Republican from Utah) and House of Representative Barbara Mikulski (a Democrat from Maryland) co-sponsored the first Joint Congressional Resolution, which called on the President to proclaim a Women's History Week each year. Congress members proceeded to pass the resolution and schools went even further as to recognize March as Women's History Month. Since 1995, U.S. Presidents have issued annual proclamations designating March as Women's History Month. In 2011, President Barack Obama released a new report called Women in America: Indicators of Social and Economic Well-Being, which describes how women are progressing in American society today and how their lifestyles have changed through the generations. This was the first comprehensive federal report on women since 1963, in which the Commission on the Status of Women (CSW) created a report on the conditions of women. Every year, Member States of the United Nations and non-governmental organizations congregate at the United Nations Headquarters in New York City to "evaluate progress on gender equality, identify challenges, set global standards and formulate concrete policies to promote gender equality and women's empowerment worldwide." Today, teachers from around the country incorporate the observance of Women's History Month into their curriculum by organizing essay contests or plays for their students. For more information, visit the Women's History Month website.